Information: Soon after the war, the Marsa Capuchins started the building of a new church on the outskirts of the parish for the benefit of the poeple living there. 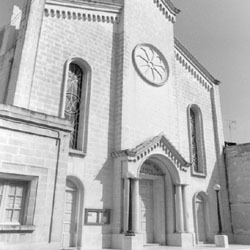 Originally the church was dedicated to Our Lady of Tears but, later on, the church was dedicated to the Queenship of Our Lady.The parish was erected in 1967. Priest: Parish Priest Rev Paul Bugeja OFM Cap.